► Any entrants who get bingo (five submissions whose inspirations run vertically or horizontally) will get a comment on all five pieces. If you do not submit five pieces, only pieces that place will receive a comment. ► Blog review of your bingo! I'm entering! I'm going vertically (acrostic, 500 words, about family, pop, and yellow). I’d like to enter! Horizontal, row three (about love, acrostic, etc). this idea is so cool, ahh!! i’d love to enter with the first horizontal row (cinquain, pop, blue ...), please!! I'm stoked for this and could have sworn I had commented already, but it's not showing up. I'd like to enter with the third column, blue, sonnet, one shot, etc. This is genius. 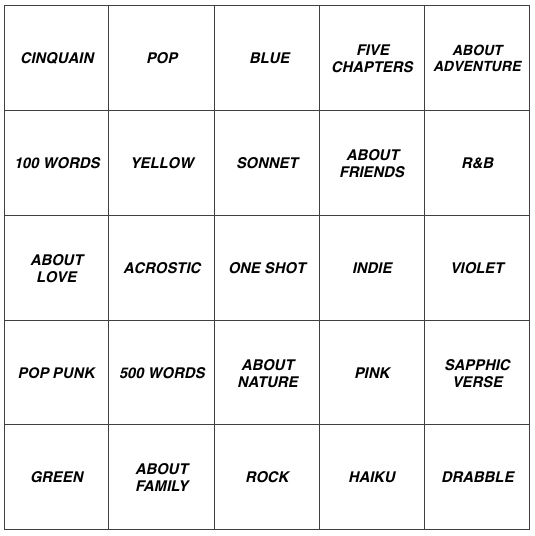 I'll enter with the fourth horizontal column (pop punk, 500 words, about nature, pink, sapphic verse). Thanks! omg lowkey that's my favourite row. You're added! This will be a real challenge cuz normally I'd never even attempt to write that much in two months. Added in! If you find you're struggling with the deadline just let me know and we can work something out. I have my sonnet, Trouble. I've been wanting to write something about my current D&D character and finally figured it out through this, so thanks! Here’s my entry for my color! And I have another lil poem for my "About Nature" topic! Here's My Own.